They’ve lost both starting safeties and both starting guards for the season. Their best linebacker, Deion Jones, won’t return for another two weeks at the earliest. And starting cornerback Robert Alford was added to the injury report Wednesday after being held out with an ankle injury. Despite so much hardship, defensive tackle Grady Jarrett likes that the front office decided to solve the issues in-house and let the NFL trade deadline pass without a move. 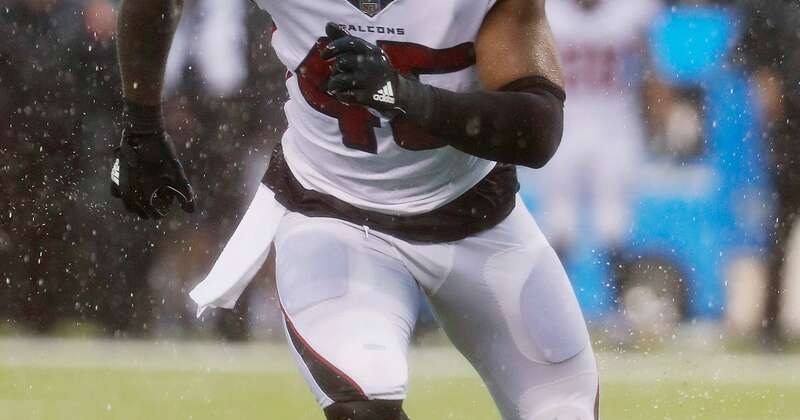 Jarrett gave the Falcons a big lift nine days ago, returning from an ankle injury that sidelined him for two games and getting two sacks in a narrow win over the New York Giants. They’ll need more players to do something similar as Atlanta (3-4) returns from a bye week to visit the Redskins (5-2). Ben Garland will make his first start at right guard after Brandon Fusco’s season ended against New York. Wes Schweitzer, who made an emergency start at center Oct. 14 against Tampa Bay, will make his fifth start at left guard. Ninth-year veteran Zane Beadles, signed this week after getting no offers in free agency, is getting a crash course at backup tackle with right-side starter Ryan Schraeder struggling at times this year. The Falcons have allowed 10 sacks and 27 additional hits on quarterback Matt Ryan while losing their first two road games. The refigured line could face a long afternoon in trying to stop Matt Ioannidis, Ryan Kerrigan and Jonathan Allen, who have combined for 14 sacks and 22 QB hits. Ryan has thrown 13 touchdown passes and no interceptions in his past five games and likely won’t hand off the ball much against a defense that allows just 80 yards rushing per game. But Atlanta is finally healthy at receiver with Mohamed Sanu and Calvin Ridley to complement star wideout Julio Jones. Deion Jones returned to the field Wednesday, but worked on the side with trainers as he recovers from a broken right foot sustained in the season-opening loss at Philadelphia. He can’t get back soon enough for a defense that ranks third-worst in scoring average and yards allowed per game. If Alford can’t play, rookie Isaiah Oliver will take his place opposite left cornerback Desmond Trufant. Oliver, a second-round draft pick, has made one start and gave up the winning TD catch against Cincinnati, but has improved with experience. Bryant was injured while kicking a go-ahead field goal against Tampa Bay and missed the Giants game. He was held out of practice Wednesday, so Giorgio Tavecchio could be in uniform again. He bailed out the team with three field goals, including two from 50 or more yards, against New York. Coach Dan Quinn says Tavecchio’s performance is another example of how the Falcons have tried to hold the season together.